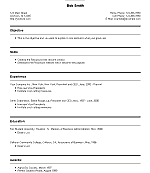 Resume Templates for Resume4Free Resume Creator an online creator program for you to use. The clean design of the free resume template styles will display your information in the most favorable light. 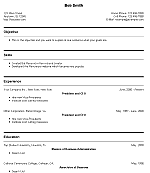 We have many free resume templates that you are welcome to use. Our free resume templates provide quick to read, professional looking layouts for your skills, education and achievements. You can choose the free resume templates that display your information in a highly complimentary format. We have created these free resume templates which can be exported very easily from our creator program, just pick your favorite styles. We make it easy to switch between resume templates to allow you to effortlessly plug your information into each template to see how they look. We also provide the ability to quickly try different fonts and choose your desired colors for the text and any accent features. There are free resume templates with design features to fix your busy, cluttered layout to give a clean, professional look. Please view your favorite styles from the examples below, you can see a larger example by clicking on the thumbnails. Each style has its own special purpose, they were designed to showcase many different fields and many different positions within those fields. The beauty of these designs is that they can be so readily adapted to those positions through the wide array of available options. You will choose the options that are appropriate for your field to tailor your resume to the needs of the hiring employer. A resume is a document that is used to communicate your career history to an employer to best meet this objective it needs to be optimized for each job. So yes, you really should write one for each job you apply for. No, you do not have to write all new content. You can draw from your pool of information adding and subtracting details as is deemed appropriate. Our templates can help to solve writing problems you may encounter when articulating your education and experience. In order to minimize detracting issues your information can be formatted in different ways. 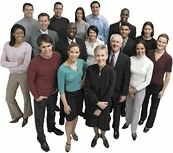 Possible issues include the need to: fill education or employment gaps, occupy more space on the page to deliver the appearance of greater significance and for the efficient organization of your facts, all while optimizing them for a specific job. The formatting can be performed through selecting a template designed to correct a specific deficiency, by choosing an optimal format and by using the proper sentence structure. It may sound like a difficult process, but our system streamlines the task by taking it one step at a time so it will be manageable for novice and expert writers alike. If you are deficient in experience selecting a resume template that focuses on your education could help shadow this fact. The same is true for insufficient education, placing your skills and experience first would populate the template with your most pertinent assets to the top. Read more about formatting and section sorting to optimize the presentation of your data. Export these free resume templates on the Preview page of our creator program.